I decided to add an extra day to my normal Weekend Movie Marathon so that I could slip in a few extra movies. This time around there is not a theme to my marathon... just me watching a movie for whatever mood hits at the time. Two-time Oscar®-winner (Best Actress, 'The Silence of the Lambs', 1991; 'The Accused', 1988) Jodie Foster delivers an "outstanding" ('Boxoffice') performance in this "razor-sharp story of suspense" ('Albuquerque Journal') about a troubled teen with a deadly secret. Co-starring Martin Sheen, Alexis Smith, Mort Shuman and Scott Jacoby, this "delicious" ('Philadelphia Daily News') thriller is "slyly ambiguous and hypnotically watchable" ('Los Angeles Times')! Some little girls can be murder! Thirteen-year-old Rynn ('Foster') is a gifted prodigy who lives in a big old house with her reclusive fathe...all alone. Or does she? When Rynn's nosy landlady and a lecherous neighbor ('Sheen') begin to suspect that this little girl is hiding a dark and dangerous secret, Rynn is determined to preserve her isolated existence at any cost – and stop those vicious rumors 'dead' in their tracks! This is a movie that was recommended to me because I am a fan of Jodie Foster. It is a movie she did when she was only 14 years old. I think I may have went into this one expecting a little more then what I got. Even though I really did enjoy this movie... I was expecting a little bit more from it. It was paced slower then what I normally prefer... but that is not a bad thing as it definitely worked for this story. It seemed that the ending was something that bothered me a little. I don't want to say the ending was rushed... because I don't think that is the case. More like it ended a bit abruptly. It left a lot open... so much so that I wish there was a second part to the story. All that being said... it is definitely a good movie. One that I am thinking I will enjoy even more so when I watch it again since I will know what to expect pace-wise and how it ends. Meg Altman (Jodie Foster) and her daughter Sarah (Kristen Stewart) play a deadly game of cat and mouse with three intruders - Burnham (Forest Whitaker), Raoul (Dwight Yoakam) and Junior (Jared Leto) - during a brutal home invasion. But the "Panic Room" into which they escape, is the very place that holds what the intruders are desperately seeking. I felt like another movie with Jodie Foster... so thought I would go with this one. It has an added bonus that it also has Forest Whitaker in it as well. I think they both did a wonderful job in this one. 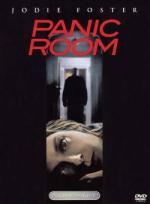 Panic Room is a very good movie that I enjoyed every minute of. Unfortunately I still only have the original Superbit version of the movie... so there is not much extras to mention on this release. I would love to upgrade this one to the 3-Disc Special Edition that was released a while back. LOL... wouldn't it blow you away if I gave Wait Until Dark a 0.5! Then the men in white coats would come and collect you, Pete. Because you would be, as we say, barking. Fifteen years after the SS Minnow's infamous "three hour tour," Gilligan and his fellow shipwrecked friends have found a way off the island for good! Thrust back into reality, will the seven companions find their reentry to civilization more difficult than anticipated? This time I felt like a little senseless fun... so I decided to watch some of the antics of Gilligan and the gang. It is a fun movie.. and that is just about it. If you liked the TV Series it is a must see... but if you didn't it is just more of the same. Being in the public domain the dvd itself is not very impressive. The one I got is one of those really cheap Dollar DVDs you see in the stores. Decent picture and sound... virtually no extras... except for a preview clip of a bunch of other releases from the same company. Nolan Byrd (Devon Werkheiser, Ned's Declassified School Survivval Guide), 12, is not alone in his frustration with getting pushed around by the school bully, but Nolan is without question one of Bubba Bixby's favorite targets. It's bad enough that he stole and brainwashed Nolan's ex-best friend, but to make matters worse, he seems to get a special thrill from humiliating Nolan in front of the girl of his dreams. After a particularly embarrassing incident, Nolan decides he's had enough and Shredderman his alter-ego, is born. Brittany wanted to watch a movie with me this morning... so we picked one of the ones she got for her birthday. This is a good movie that is fun for the whole family. I really enjoyed it. And Brittany really liked it a lot... this was her 3rd time watching it since her birthday on Nov. 4th! Brittany wanted to watch a movie with me this morning... so we picked one of the ones she got for her birthday. Not going to happen Jimmy!... and stop trying to give her ideas! If you want to know the movie without watching and listening it, you can always read a recap here. This is what I've done, no one can make me watch this unless my niece had it and want to watch it. I'm unable to refuse her anything even if it's a torture for me most of the time... She made me sit trough The Teletubies, Dora, Diego, Caillou and a lot of boring thing like that. But she had some good taste sometime, she watch Futurama and The Simpsons (she doesn't get all the joke, but she's only five years old). Yeah... I pretty much the same way with Brittany... that's why I said don't give her any ideas! I am sure the day will come when she wants to watch it with me. Every since the first time I saw the TV Series Alias I have been a fan of Jennifer Garner. So this movie was a no-brainer for me to get. Matter of fact I originally bought the first release which I believe was a special edition... but this one (Fun and Flirty Edition) had enough new extras that I wanted to upgrade. It was my wife that originally got me watching romantic comedies... and to this day (13 years after her untimely death [12/17/95]) I still think of her every time I watch one. And this is a fun one. I think Jennifer Garner did a great job being a young girl trapped in a 30 year old woman's body. In my opinion it is definitely worth the time put in to watch it. Have you seen the other versions of this story? Freaky Friday with Jodie Foster, remade with Lindsay Lohan and Jamie Lee Curtis, and Dudley Moore in Like Father Like Son. I have seen all those... even own the Freaky Friday with Lohan and Curtis. But even thought it is similar to those... I relate this one more in the line of Big with Tom Hanks... as it don't involve 2 people... just the one that makes a wish to be 30 on her Birthday.